In May 1983, the Queen undertook a state visit to Sweden to visit King Carl XVI Gustaf and Queen Silvia. Now this is what I call super powered bling: two queens, bringing out their best. 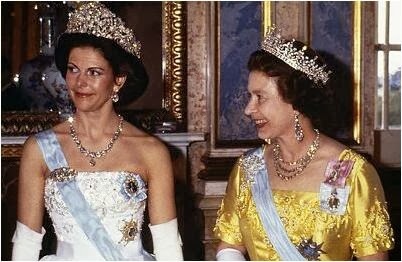 Silvia is wearing the massive Braganza Tiara; Elizabeth is wearing her favorite Girls of Great Britain and Ireland Tiara. What I love about this is that QEII is making up for the fact that the Girls is not quite so tall and diamond-packed as the Braganza by packing on maximum sparkle absolutely everywhere else. She's got the Greville Chandelier Earrings, the George VI Festoon Necklace, and the True Lover's Knot Brooch, the largest of her bow brooches. Both queens are wearing the baby blue sash and star of Sweden's Order of the Seraphim and the Queen has on her family orders (Silvia has Carl Gustaf's portrait). A classic jewel showdown - and oh, how I desperately wish we'd get another Sweden/UK state visit! In current news... Church at Sandringham was once again on today's Sunday agenda. The Queen wore the top part of the Round Cambridge Emerald Brooch without the pendant.